The 336 foot long Al-Ind-Esk-A-Sea was launched in Wisconsin on May, 1945 as the private cruise ship “Coastal Guide”. She was renamed the Sgt. George Peterson and transferred to the U.S. Navy during the 1950’s until being placed in reserve status and then sold for commercial use in 1971. After a series of owners, the Trans-Alaska Fisheries bought the ship and renamed her Al-Ind-Esk-A-Sea, putting her to work as a fish processing ship off of Alaska. On October 20, 1982, while at anchor off the Port of Everett, a crew member’s cutting torch ignited some insulation and set the vessel on fire. The six crew members aboard escaped via the tender Alaska Trader. 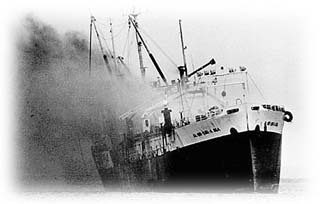 Firefighting efforts were hampered by cyanide gas which was produced by the burning insulation and the danger of the 18 tons of pressurized ammonia exploding. The fireboat Alki eventually doused the flames, but fireballs continued to burst from the lower decks throughout the night. The fire continued burning through the 21st, and the Big Al sank at 10:14 on October 22nd, 1982. She slipped quietly beneath the waters of Port Gardiner about a half mile offshore, where she remains to this day. Today, the Al-Ind-Esk-A-Sea is an impressive, but very deep wreck that is best to dive from one of the local dive charters. The 336 foot long freighter lays on her starboard side, with her bow pointing northeast in about 230 feet of water. The port side of her large hull lies nearly level at a depth of about 180 feet due to her 50 foot beam. Her superstructure, holds, machinery and steel hull are still in tact, which makes multiple dives required if you wish to see the entire wreck. The side of the hull where you descend on the wreck is very flat and covered with fine silt. It looks very much like the sea floor, and more than one technical diver has thumbed a dive early, thinking they missed the wreck, when in fact they were on the hull. 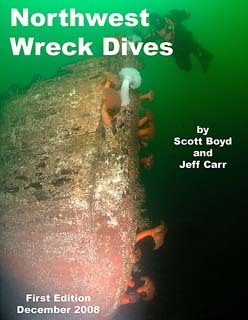 For more information on diving the Al-Ind-Esk-A-Sea, please see Northwest Wreck Dives. Depth: 190-230' Hazards: Very Deep, Very low visibility due to runoff.